Peter's kitesurfing blog: Session 8 – Windy conditions and colliding kites! 4pm start, not too crowded. I thought that the wind might be a little bit too strong but decided to have another go “at the upper margin”. The wind seemed a bit stronger than Session 7. Tentative about getting up. Headed left half in the water. When carving starts, again get a lot of pull and started slide slipping. Solution is to fly the kite more into the wind? I tried that. Getting going is touchy: too much power and you get hoiked off your feet – this happened a couple of times. The board hit my wrist (small bruise) and my left foot (small bruise). 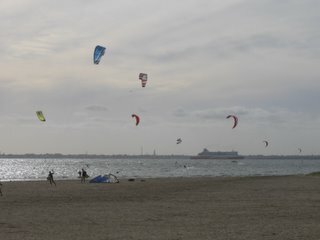 Then I did a a run out left where I felt in control and was preparing to go back when another kiter collided his kite lines with mine resulting in immediate mayhem. The other rider said he would try to “surf through” my lines – which of course did not work. Both kites were tangled together and both of us getting dragged. He eventually let go of his bar which resulted in his kite pulling free from mine. I body dragged in with my board. His rig was tangled, but he seemed in good spirits. When conditions are “full” you are not the only one who may have trouble. 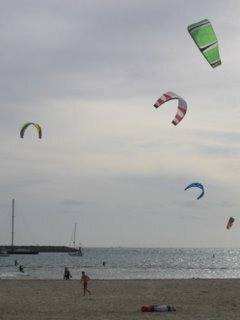 Others were ditching their kites and flailing. But many were whizzing along apparently at ease with the conditions, dialing in as much or little power as they need. I got lifted once about 1m; quite a good sensation and under control. The seat harness was definitely more comfortable, but a bit harder to walk in due to the straps under the legs. No riding up though. NOTE: The tendency to pull on the bar is a real trap for beginners. You need to focus on backing off the power by pushing the bar away if you are getting over powered. This is a bit counter intuitive. Flying the kite into the wind window is not the only way to reduce power. 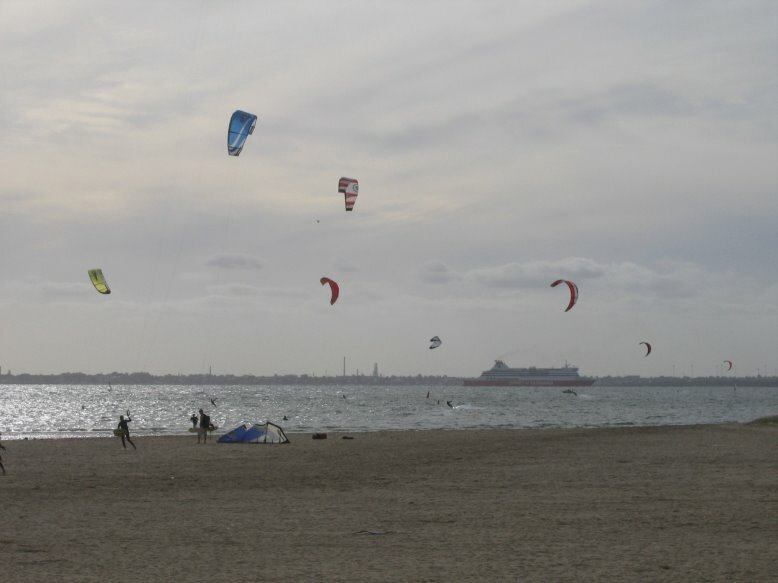 thanks for keeping records of your progress with kitesurfing. i have just started learning and only have 6 hours on the board and it helps to hear how you overcame difficulties. Good to hears you are getting some value from my log. Stick with it - you will be utterly stoked when it all clicks together. From memory, this was on about my 10th session.